All of us on staff felt that the JECELI Chicago Cohort 2 has had a very exciting and promising beginning. It is so challenging to come into a new group, perhaps more for adults than for children, who have more recent practice! However, the fellows did not hold back but actively engaged with each other in so many different ways, and the group is already becoming a community. And as a community, they dove right into the discussions. 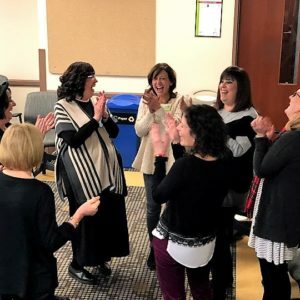 These centered around text study, complex discussions of culture and Jewish values, and creating relationships through stories, as a few examples of our work together. None of us knew what to expect from the presentation of therapeutic improvisation about communication on Tuesday. What we discovered is that WE were the actors and that our lines came directly out of the interactions in our lives, in very amusing ways! Overall, we considered how culture consists of values and behaviors that express those values, ending with a protocol to discover the cultural aspects of JECELI Chicago Cohort 2 so far. We are so fortunate to have our JECELI staff members back again for this cohort. Individually and as a group, they have the ability to balance the core commitments of the program and the unexpected liveliness of a responsive learning community. They provide wonderful lived examples of the kind of leadership that we hope the fellows find powerful and rewarding. Fellows are in the process of learning who their mentors will be, and the initiation of those essential relationships. The whole group will reconvene for the April 24-26 Seminar – IT IS HARD TO WAIT!